Sarah Moran is running a raffle in the school for the Dream Bike Initiative, having being inspired by the Nationwide programme featuring ChildFund’s trip to Ethiopia with two of the ChildFund Camogie ambassadors and intercounty camogie stars Mag’s Darcy (Wexford) and Aoife Murray (Cork) and Nationwide’s Ann Cassin, which aired last year . This is not the first time that Sarah Moran has raised money for the Dream Bike initiative. Last year having seen the Nationwide programme and despite her very busy schedule in Transition year she painstakingly produced a range of handmade Christmas cards. They sold extremely well and when you see the samples you will see just why. All proceeds from the sale of the cards went to ChildFund Dream Bike initiative. The school also recognised her with a mini enterprise award for this initiative. 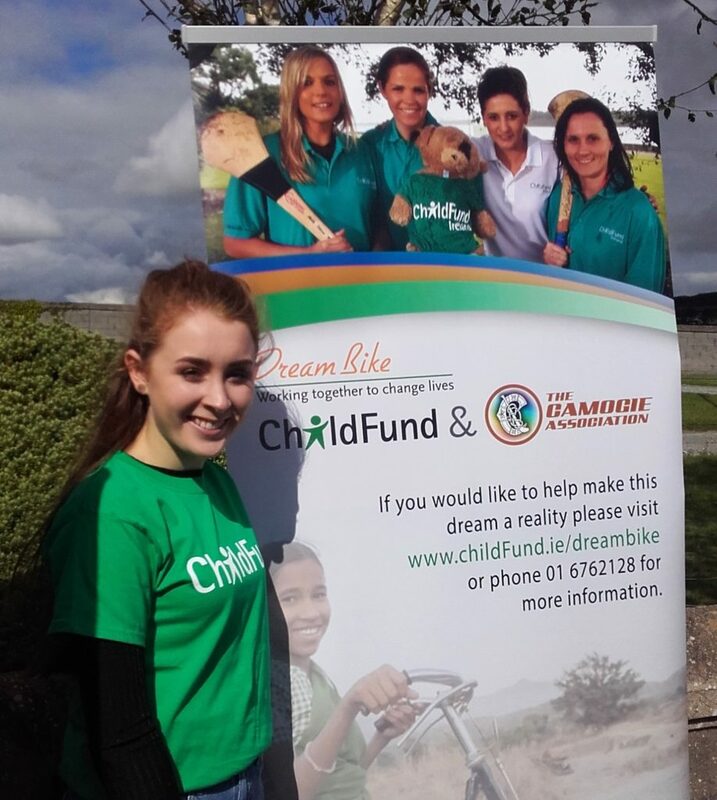 One of the people to receive a handmade card was a senior manager from Irish Ferries who was so impressed by Sarah’s idea of raising money to support girls continue their education that he pledged the first gift of travel vouchers for a raffle in aid of the Dream Bike Initiative. So this year again Sarah set to work to raise funds and awareness for this cause, that is close to her heart, empowering women and giving them equal opportunities and access to education by organising this raffle to be held at the end of September . Sarah recognises the importance of education and she herself, hopes to pursue a career as a primary school teacher. Prizes for this raffle include Travel vouchers from Irish Ferries, a GHD hair straightener and a hamper. She is currently selling tickets at the school. Sarah Moran 5th year student Loreto School Wexford.